Benjamin Moore Advance is an interior alkyd (oil) that cleans up with soap and water. Advance is ideal for going over alkyd or an easy to use oil based product. Please Scroll down to view the Benjamin Moore Virtual Fandeck. Benjamin Moore Advance is an interior alkyd (oil) that cleans up with soap and water. Advance is ideal for going over alkyd or an easy to use oil based product. 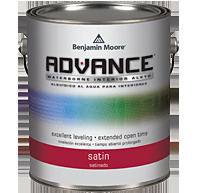 Benjamin Moore Advance is a premium-quality waterborne alkyd enamel that delivers the desired flow and leveling characteristics of a conventional alkyd paint. It provides a tough satin finish that stands up to repeated washing. It is easy to apply, resists spattering, has excellent open time, and cleans up with soap and water. Ideal for interior trim, doors, walls, and ceilings. For new or previously painted wallboard, plaster, masonry, primed or previously painted wood, and metal. Do not apply when air and surface temperatures are below 50° F (10° C). (MONTVALE, NJ - JUNE, 2010) - The newest coating from Benjamin Moore is called Advance®, and with good reason: This is an alkyd-based interior paint powered by the brand's Gennex waterborne colorant system that moves the needle well past what others in the category offer on the innovation dial. Advance reflects Benjamin Moore’s advance on the technology in so many ways. A mineral versus petroleum formulation of the alkyd is one of the key differentiators between Advance and the acrylic-based hybrids. It is the mineral-based formulation that enables the water dispersion of the Benjamin Moore tints. And, of course, one of the tremendous advantages of the Benjamin Moore Gennex tints is that they are totally VOC-free, so Advance is authentically low-VOC even after the colorant is added, and regardless the color choice, which numbers more than 3,300. Custom color matching also is available. Though alkyd paint typically is preferred for trims, doors, furniture wainscoting, chair rails, base moldings and cabinetry, Advance will likely win favor as a wall paint, as well, with a flat sheen and primer soon to be added to a range that initially includes satin and high gloss. The application is easy, with excellent flow and leveling traits. Advance will stay whiter longer than conventional alkyds, and it dries to a hard, durable surface promising years of beauty. From Anonymous of Village Mills, Texas on 10/27/2014 . From Anonymous of Beaumont, Texas on 10/27/2014 . From Amber Alvarado of Grand Island, Nebraska on 7/15/2012 . From Todd of North Shore, Massachusetts on 2/26/2011 .